Chef Pinon is a native Thai and brings with him close to more than 25 years' culinary experience in Thai Cuisine. He loves using fresh, quality, good grade, authentic Thai ingredients, herbs & spices & is very talented in coming up with new recipes for new dishes to the delight of the many loyal patrons to Charcoal Thai. Some of his Signature Specialties include: Century Egg with Minced Pork, Thai Prawn Cakes, Thai Green Curry Chicken, Thai Olive Fried Rice, Thai Green Mango Salad. Chef Pinon was the Resident Chef when Charcoal Thai first started 3 years ago. Previous owner Mr Lee Wei Thye was touring Thailand & he fell in love with Thai Cuisine so much that he invited Chef Pinon to come to Singapore. 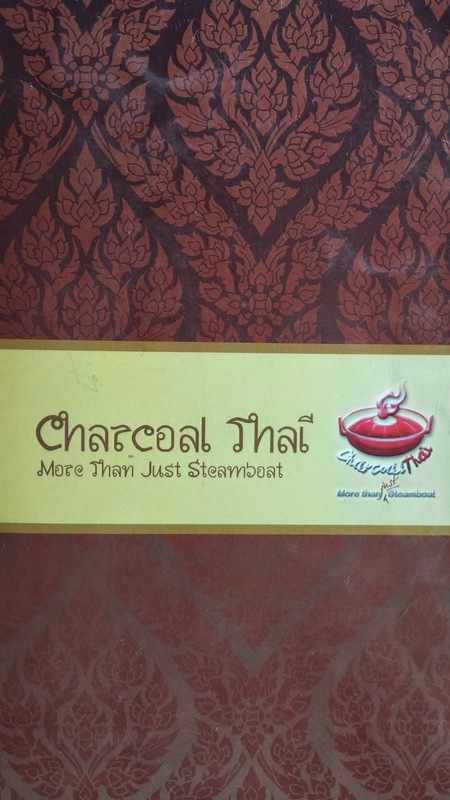 With so many businesses on his hands, he could not find time to manage Charcoal Thai full time so Lee Wei Thye handed over Charcoal Thai to Angus Ang in 2014 who become the current owner together with his lovely wife Ms Zelene Yong. Currently, menu planning is done by Angus Ang & Chef Pinon, with menu changes twice a year. Chef Pinon attended many Thai cooking school. He worked 25 years as a chef, started about 27 years. He is well-versed in Thai, Western Cuisine. Inventory management is handled by Chef Pinon, who works mainly with a good network of reliable suppliers. Chef Pinon shared that Mookata or Thai Steamboat is uniquely special as you can drink the soup as you cook the food. Olive Fried Rice (Kao Pad Ma-Kok) at S$9.90 - Chef Pinon prepares this dish using core ingredients : dark olives from supplier, rice, mixed vegetables, cashew nuts, served with whole roasted cashew nuts, fresh cut chili padi, egg omelette, lime, cucumber, julienned Thai green mango. How it is done - Chef Pinon fries the garlic & olive oil, adds sugar, dark olives, soya sauce & rice & stir fry together, then adds mixed vegetables consisting of corn, carrots, sweet peas to the fried rice & stir fry further. To serve Chef Pinon simply garnish the olive rice with raw fresh onions, chili padi, cashew nuts, Thai green mango julienned slices, julienned egg omelette, cucumber slices, lime. Tasting Notes - Mixture of cashew nuts, omelette julienned egg, dark olives, fried rice, chili padi, fresh cut onions, green julienned raw mango, cucumber slices gives an altogether sweet, sourly, spicy, nutty, crunchy flavor & texture - refreshingly appetising combination of flavors. The olive rice is not oily at all. The cashew nuts give nutty flavor, onion give spritely refreshing flavor, there is a tinge of spicy due to chili padi, sourly flavor from the unripe Thai green mango, tinge of savory from the dark olives, sweetness from the mixed vegetables, onions gave a refreshing spritely bite & crunch to it, the omelette egg lends an added fragrant aroma, & the rice is fried just nice not overly oily, quite an appetising bite. This dish is prepared ala minute so be patient to wait for your order. Special Thai Prawn Cake served with Tasty Thai Sweet Sauce (Tod Mun Kung) at S$9.90 for 4 pcs - Chef Pinon uses core ingredients : fresh prawns, flour, Dory fish, bread crumbs. This dish is served with side salad, cucumber, lettuce, tomatoes, Thai plum sauce. How it is done - Chef Pinon gets fresh prawn from his regular supplier who delivers the prawns deshelled. To the de-shelled prawns, he adds 10% Dory fish, pork lard & chopped the mixture into a paste. This is followed by a tinge of salt, pepper, chopped garlic, fresh coriander, Thai Coriander to flavor the prawn paste. He further kneads & pound the paste in a large container. Chef Pinon prepares a pot daily to make about 50 cakes. To serve he makes the paste into small patties & roll them in flour, bread crumbs, then deep fried in hot oil & serve with plum sauce..
Tasting Notes - The prawn cakes taste sweet, has a soft, chewy & fresh texture. The prawn paste is kneaded very thoroughly to give it that tangy chewy texture. The sweet plum sauce lends a sweet flavor to the prawn cakes. The bread crumbs are only thinly coated thereby giving you a relatively thick prawn based cake with a better bite.